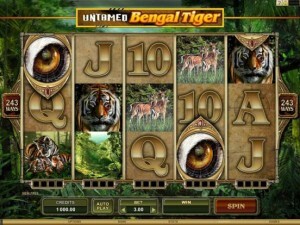 Bengal Tiger is one of the four Untamed slot machines that Microgaming has released so far, each one being themed around a different wild creature. You get one of the more majestic ones in this game, where the Bengal Tiger is the star. The games are all modern, with ways to win and with features which were modified to be a bit different than what most of the competition will give you. As for the star of the theme, the Bengal tiger, about 2,500 individuals exist and they have a length of 9 to 10 feet, a height of 3 to 3.6 feet and a weight of about 490 lbs. Dangerous and beautiful creatures, these predators deserve their own slot machine. You’re getting a top prize of $2,250 from this slot, plus the usual mix of free spins, lucky nudges, scatters, wilds and wild reels which all Untamed games offer. 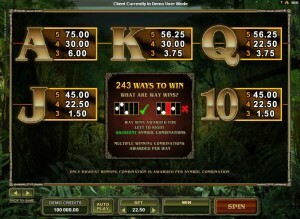 The game has 5 reels and a total of 243 ways to win. 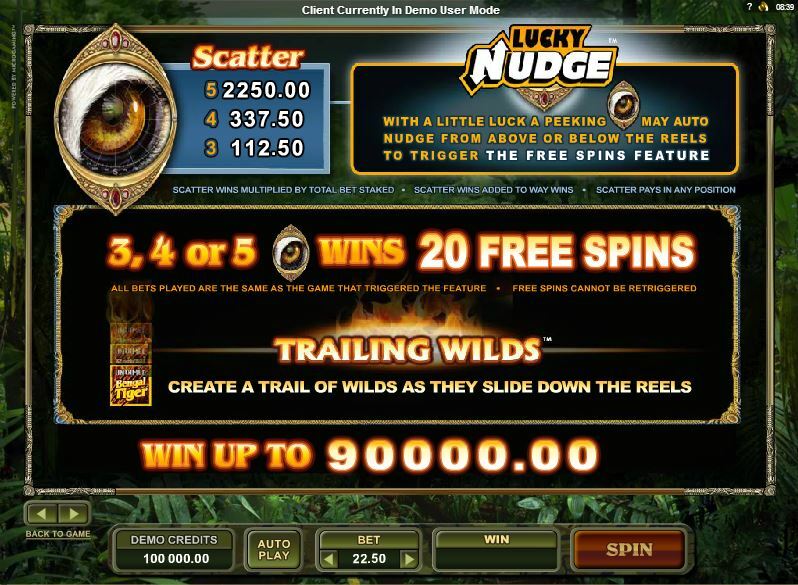 The game uses wild symbols and allows you to collect them and turn them into wild reels, plus it has scatter symbols, ways to win, lucky nudges and free spins with trailing wilds. As many other slots do these days, Bengal Tiger offers 243 ways to win, which you trigger by wagering on the equivalent of just 30 paylines. You will get combinations by landing symbols that appear from the leftmost reel and go towards the right, on consecutive reels. They don’t appear on fixed positions that are part of paylines like they do in older games, and your chances of getting a paying combo increase considerably. You will discover that the wild’s symbol is the one with the logo of the game on it. With the exception of the scattered Tiger Eye, this wild can replace any other symbol. Since this is a slot with ways to win, the wild only needs to be on the right reel, where a symbol is needed to form a combo, and it will happen. 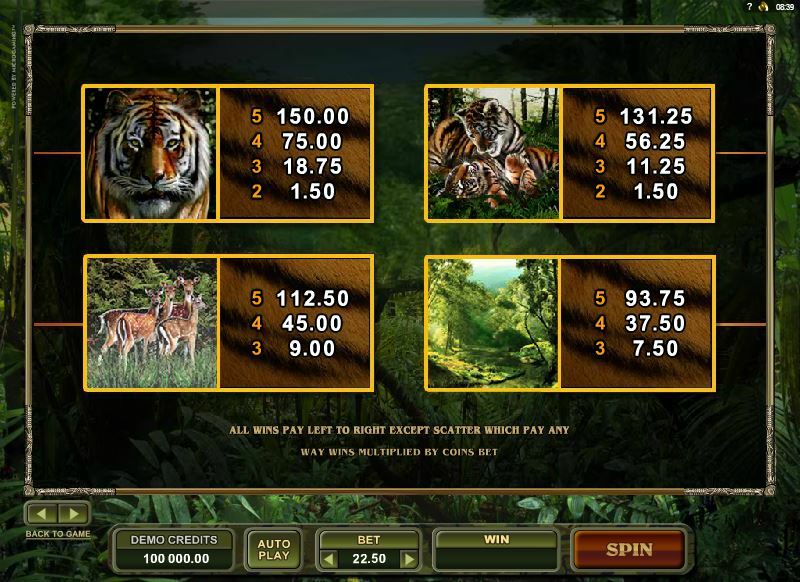 The game also rewards players when they get combos of 2 to 5 wilds on the correct reels, offering up to 500x the line bet for it. At the bottom of each reel, you will find four small boxes, in which you can collect the wild symbols that appear on it. Once you get four wilds collected, the entire reel will turn wild for the next four spins. The slot’s free spins are not typical ones, offering Trailing Wilds as the feature that makes them more fun. 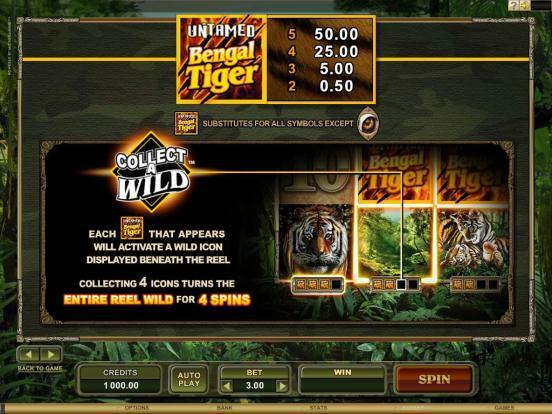 You need between 3 and 5 scattered Tiger Eye symbols to get the 20 free spins started. The Trailing Wilds feature will give you a trail of wild symbols, as they slide down the reels. These free spins aren’t the kind that can be retriggered. The scatter symbol that gives you the free spins will also offer prizes at the same time. 5x to 100x the round wager will be awarded for the same 3 to 5 scatters. This feature will help you trigger the free spins, if you’re missing one scatter symbol and it’s located right above or below one of the reels. 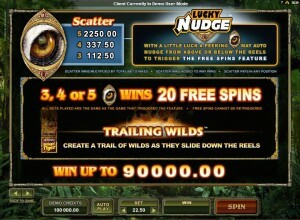 The feature will nudge the scatter in the right direction, so you can get into the free spins. 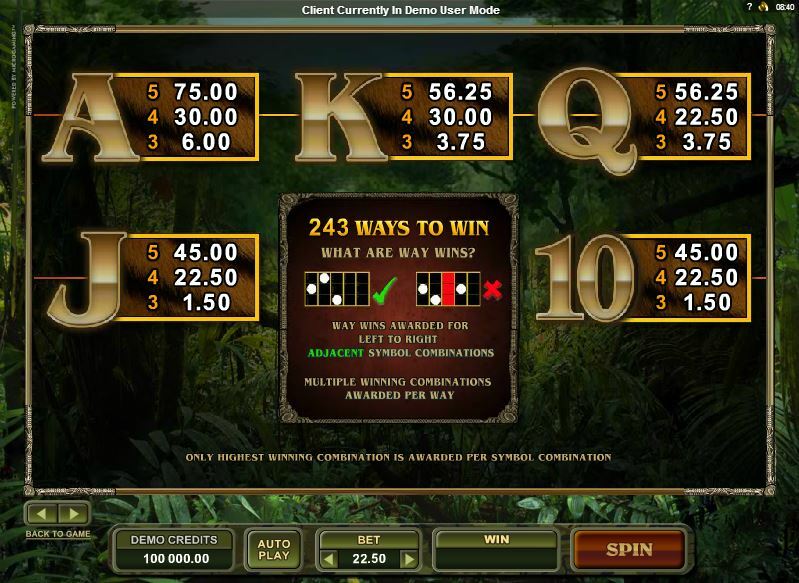 The betting system is identical to the one from the other Untamed titles. You get to use 30 lines instead of betting on 243 ways to win directly, with a minimum of 1 coin on each one, and a maximum of 15. Each coin has a value between $0.01 and $0.05, so the line bet doesn’t go higher than $0.75. A $22.50 maximum bet is allowed. The rewards are lower than in the other slots from this series. 100x the bet is the most you can get from the scatter, which means $2,250. The other slots give you 250x the bet. The game has a painting like quality to it that I enjoyed. 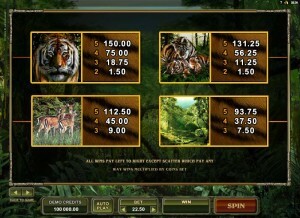 The symbols show off forests, deer, Tiger cubs and male Bengal tigers, and they will animate slightly when they are involved in winning combinations. They will also have some bland playing cards, brown and looking like they are placed on top of tire trucks left in the mud. The background picture is another beautiful part of the design, with a forest that looks alive, with leaves that move slowly as the wind passes through them. Symbols: Tiger Eye (scatter, 100x the bet), Game Logo (500x, wild), Bengal Tiger (200x), Tiger Cubs (175x), Deer (150x), Forest (125x), Ace (100x), King (75x), Queen (75x), Jack (60x) and Ten (60x). The game has smaller top prizes than all the other three slots from the series, so I’d say go for one of the other ones. 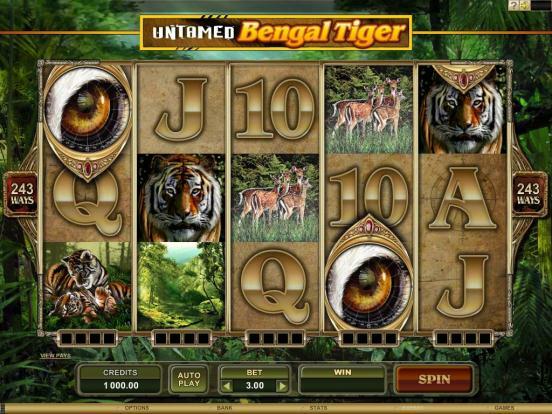 The Untamed – Bengal Tiger slot machine is offered through the Microgaming platform, so if you want to play it for real or just to practice, look out for casinos that use it.